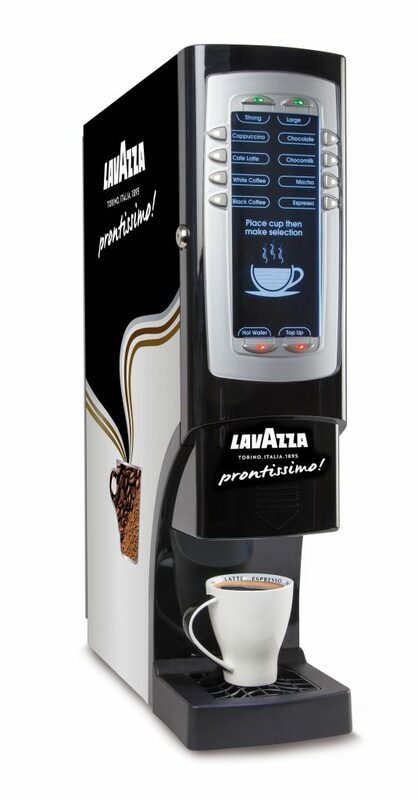 KSV Vending prove to be Prontissimo for Lavazza Demand! Only last month KSV Vending announced the introduction of Lavazza Prontissimo to our range of coffee choices for our Cappuccino machine customers. Demand is through the roof! Maybe it’s the 100% Arabica beans used to produce it, or the Lavazza family having over a century of quality coffee experience. Certainly the 10% micro ground coffee content in Prontissimo adds to a very special coffee indeed. Prontissimo translates from Italian as “Supremely ready” which certainly KSV Vending were in anticipating demand for this excellent coffee. Next time you order from us why not try a bag if you haven’t already or if you are considering a new or replacement cappuccino machine, our fully Lavazza branded Mini Magnum machine adds great visual support to this Italian classic. Lavazza Branded Mini Magnum Coffee Machine.